Routers are devices that are used to direct traffic flow between local computer networked together through radio waves or Ethernet cables. A network that uses Ethernet cables is a hard wire network. A network using radio waves is called a wireless network. Routers can connect both wireless and wired devices to a network and connect to an internet connection. Wireless routers can connect several different devices at one time such as your home printer and cellphone. There are several different companies that make wireless router. 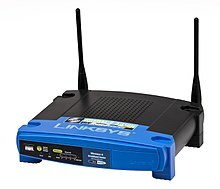 One of the most popular brand is Linksys. Routers can range from inexpensive to expansive depending on the brand and specs. This page was last edited on 18 January 2015, at 19:05.